"I see the world as "glass half full". That is what my portrait means to me. No Matter how much rain there is, there's always sun after. My point-of-view is looking up, looking up at the sky, the light, the color, the imagination. Seeing the bright side of everything is my favorite thing about myself." -Tariq Harris, teen photographer IMAGINE=IMAGE. 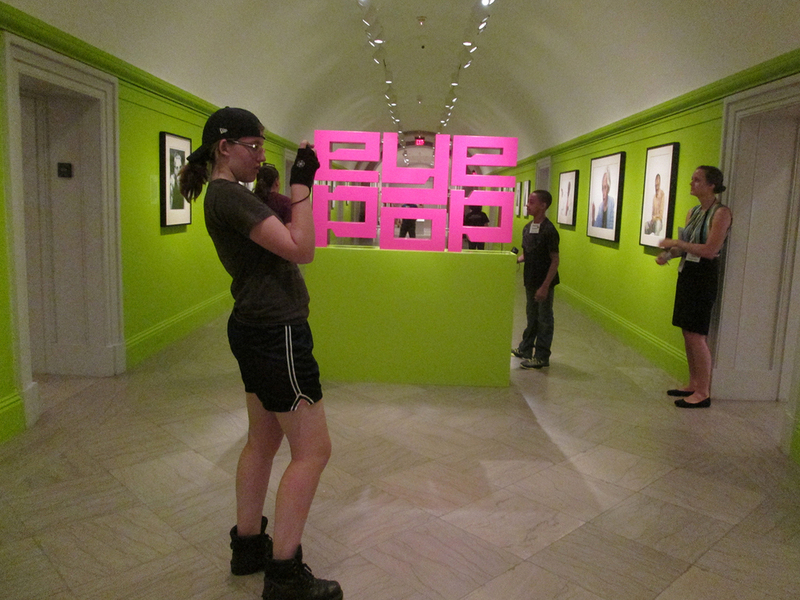 The National Portrait Gallery's IMAGINE=IMAGE Program used the power of portraiture to prompt teens, ages 13-16, to closely examine themselves - who they are and who they aspire to be. Using point and shoot cameras provided by artist Joanne Miller, the teens explored image-making by creating a portrait that reflects key aspects of what makes them who they are. The final portraits incorporated techniques and ideas seen in portraits at NPG such as symbolism, lighting and background. Portraiture takes into account the sitter, artist and audience. Planning the portrait was an individual decision. Some teens brought objects representing hobbies and talents. They were eager for friends and family to view them in a new light. However, teens worked in pairs to create their final portrait. Their success was based on the trust they developed over the course of the program. The program culminated with an exhibition in the courtyard.